When I found out that I was expecting twins it was a big surprise! I was excited but also a little apprehensive. I was asked at my first midwife appointment whether or not I wanted to breastfeed. I answered 'yes' but that as I was going to have TWO babies I wouldn't put too much pressure on myself. I thought that if it didn't work out it wouldn't be a problem, I'd just bottle feed. However, as I went through my pregnancy, I decided that I didn't want to compromise on what was best just because I would have two babies to feed. I knew that breast milk is best for all babies, so - I was just going to have to work a little harder! 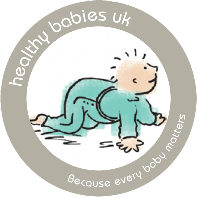 When my babies arrived we certainly didn't find breastfeeding easy and to help me to keep going when it was tough I set myself targets. Some times they were really short, like just getting to the end of the day. I just kept challenging myself and the longer I persevered the more I was determined to succeed! A few weeks in I found some amazing support which also helped me to carry on and achieve my goals. The encouragement of other people who had breastfed their babies was incredibly valuable. I didn't feel so alone and it helped me worry less about the continuing changes and challenges. My husband. He was very supportive of me breastfeeding and helped to change nappies and wind the babies whenever he was around, even at night! 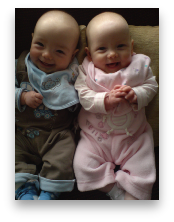 A twin feeding cushion. When I fed my babies together this helped to keep them in a good position and meant that I had a hand, or even two hands, free during feeding! Sally, mother to Elliot and Martha. My name is Amanda and I have triplets! 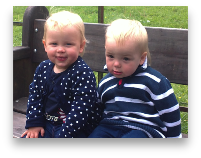 George & Henry (identical boys) & Ellie. 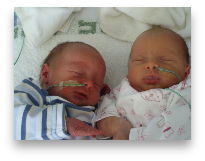 They were born at 35 weeks. 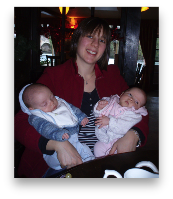 We were in hospital for 3 weeks after their birth and as a result I had help and advice on hand at each feed which I found invaluable whilst establishing feeding in those early days. 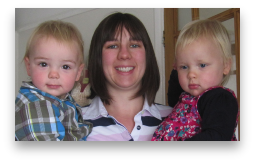 I was also put in touch with another triplet mum who had successfully breastfed, which was also a huge help, having encouragement and support from another mum who had 'been there'. I was so grateful for the support that I received, and strongly feel that all breastfeeding mums should have access to support and information, should they need it. It was this that inspired me to become a breastfeeding peer supporter. Being a peer supporter is very rewarding. It is fantastic seeing mums with their new babies growing in confidence & sharing in their joy at successfully breast feeding. It is also wonderful working as part of a team, I have made many great friends with other peer supporters with in our group.